●Highly safe carbon black ink produces rich density. ●Quickly dries and easy to use. ●Contains treatment ingredients for protecting lashes. Adhesive-free. ●Water-proof formula resists tears, sweat and water. ●After applying base layer, wait until it dries. Then, apply another layer to achieve beautiful separate and curl finish. thick, rich and dense long lashes. 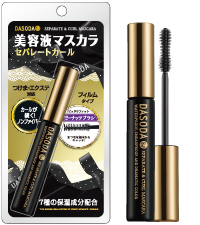 ●Volume and length assisting brush seals fiber evenly on the lashes. Creates well-defined lengthy lashes through multiple layers. ●Lash-plumping treatment ingredient fully seals lashes. ●Contains protective treatment ingredient. Adhesive-free. sweat and water. Stays all-day-long. 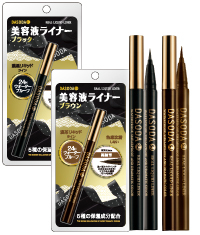 ●Dries fast and defines eyes without smudging. adheres to the skin. Powerfully resists tears, sweat and sebum. you wish with precision and style. rich dense black until the very last drop.